Emily Tennyson (1813-1896) aged around 49. Painting by G.F. Watts. 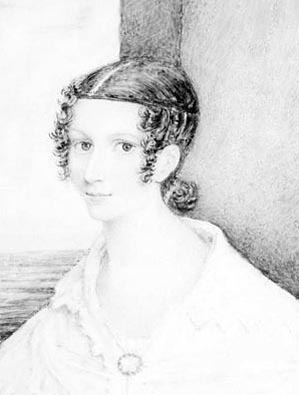 Emily Tennyson (née Sellwood) was born on 9 July 1813 in Horncastle, Lincolnshire, & was sixteen when she first met Alfred Tennyson. They were engaged in 1837, but three years later the engagement was mysteriously called off, perhaps owing to Tennyson’s financial problems. In the 1840s, Tennyson received more favourable reviews of his poetry & was awarded a Civil List pension in 1845. In the 1840s, Tennyson received more favourable reviews of his poetry & was awarded a Civil List pension in 1845. 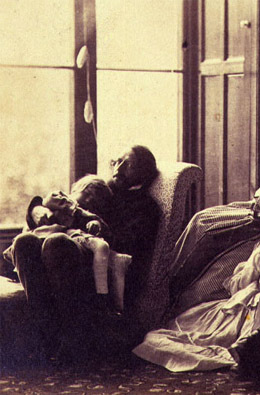 Four years later Tennyson & Emily renewed their engagement & they were eventually married on 13 June 1850.
holding one of their sons, Hallam. Photograph taken by Lewis Carroll in 1857. At this moment, Emily married a promising poet; however, after they returned from their honeymoon in October 1850, owing to the immense success of In Memoriam A.H.H. (1850), Emily found herself married to the most sought-after poet of the day, whose celebrity was on a par with that of Charles Dickens. Emily disliked publicity perhaps even more so than her husband & was glad that he was protective of their domestic & intimate life, & never mentioned her in his poetry. She was happy when her husband suggested that they move to Farringford House in Freshwater & never worried about its isolation. The view from Farringford House over Freshwater Bay by Helen Allingham. On first looking from the drawing-room window at Farringford, Emily thought ‘I must have that view’ & came to regard their home as the ‘dearest place on earth’. However, the volume of visitors over the years meant that Emily must have felt as if she were running a hotel, in addition to being Tennyson’s business manager & secretary. As well as the practicalities of having guests, Emily had to protect her husband from overbearing ones, while ensuring that all their visitors were comfortable & happy. Left – Emily Tennyson by G.F. Watts. Centre – The gate between Dimbola Lodge & Farringford House that allowed Julia to easily visit. Right – Julia Margaret Cameron by G.F. Watts. The photographer Julia Margaret Cameron greatly esteemed Emily, regarding her as a ‘living stream of love whose fount is never dry’ & often visited Farringford to spend time with Emily when Tennyson was away.